I got the opportunity to visit the wards of Tameside Hospital with a member of the chaplaincy team Neil and on another occasion a befriending volunteer called Marie. As with all my volunteering, but particularly in hospital, the patients’ confidentially is essential so I will just give a general overview of the services offered and the volunteer roles. Befrienders are there to chat to the patients to support their emotional and psychological needs. Being in hospital can be quite disorientating and extremely lonely especially if you are older. I visited a ward with Marie that predominately had patients with a diagnosis of Dementia. Marie’s father had been on the ward and had died two years ago. Marie had started volunteering as a befriender a year after her father’s death and had kept the time and day she spent time with her dad as her voluntary shift. By sheer coincidence she volunteered exactly a year after his death to the day. Marie was a trained ‘Dining Companion’ too, as am I. This is a type of volunteer who helps at meal times in the hospital providing companionship and support. On our shift together we talked to the patients, many of who were delighted to chat, and then we supported them with their evening meal. The nurses help feed those with swallowing problems or more complex needs but it is nice for the patients to have dining companions to sit with them. In the training you are taught how to support someone as simply as encouraging them to eat and in some cases reminding patients to eat who may have forgotten, good nutrition being essential to recovery. I helped one lady simply to open a yogurt and another lady needed encouragement to eat anything at all. 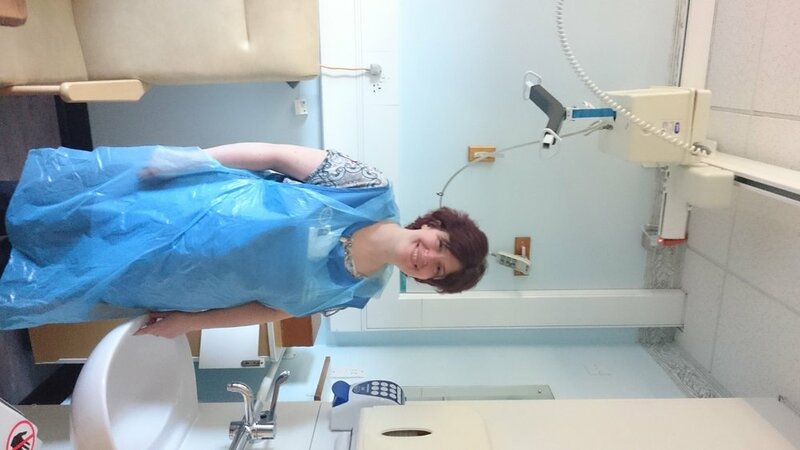 I was only on the ward for a couple of hours but I was astonished by the satisfaction I got in that short time. Just helping someone to enjoy a meal or to spend a few minutes asking how someone’s day was. Some patients were happy with a smile and a few words and others would chat away about where they were from or their families. On a separate day I found out how to support patients with their spiritual needs by joining the chaplaincy service. I met Neil in the Multi-faith prayer room, which is open for people to use when they need it, whether that is patients or relatives. The chaplaincy service is 24 hours a day if needed and different faiths can be catered for as necessary. Neil visits the wards as do a number of volunteers to provide support by the bedside. Each interaction differs. There might be a small discussion of the chaplaincy service and what it offers or it may be a prayer by the bedside or even Communion can be offered. Neil may also ask if a patient would like to be added to the prayer book and relatives are welcome to add names to the book in the prayer room. The patients were very friendly on the ward and most of them chatted to us. Neil was mindful not to disturb anyone sleeping. Some of the patients had met Neil before and said hello or requested a chat or a prayer. Others Neil introduced himself to and explained the chaplaincy service. One of the things Neil notices most often is that patients aren’t sure what day it is because each day in hospital is pretty much the same as the next. Neil asked the patients in particular if they had family or visitors. Most did but one gentleman didn’t so Neil had a chat with him and arranged to see him another time as well. I asked Neil about this later and he said that he likes to provide support to people when they are leaving hospital in particular so they don’t become isolated once they are home. He may contact a local church to keep in touch with the patient if they would like. This is very important to someone who maybe alone. The volunteers in the chaplaincy team come at a time that is suitable to them and usually spend a few hours on the wards. In the hospital there is a service at 2pm on a Sunday that patients can attend if they are able to. One important but necessary need is to be able to remind patients that they service is happening and support them to attend, especially if they would need support getting there such as a wheelchair. This would be something that Neil would like volunteers to be able to help with. The gift of listening is one of the greatest things you can offer as a volunteer. If you would like to volunteer for the befriending or chaplaincy services you can contact the Voluntary Service Manager Karen Eato on 0161 922 5334.